HILLSBOROUGH COUNTY — Neighbors in a Hillsborough County community are living in limbo. They demand to know when something will finally be done about the fire damage next to their condos. 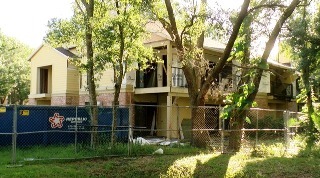 They claim the HOA is dragging its feet on repairs. Whenever Carl Porchiazzo orders delivery pizza he has to give the driver special instructions. "Look for the abandoned derelict building. I live in the derelict building," he said. Metal fencing, broken glass and no railings are some of the issues. It's a building not fully repaired a year-and-a half since a fire torched it. "Well I would like to move but nobody would buy this unit and anything I try to do they just see the building and they run," said Porchiazzo. He insists it's more than just an eyesore for the four families living on the other side of the same building. He says rodents are getting in through a hole in the roof. But most concerning is what happens after sunset. "It's pitch blackness," he said, "You can't see nothing." Neighbors say the Grand Reserve Condominiums Association has not given them any solid answers about what's taking so long. "I've called, I've emailed," said James Spradley, who rents a unit in the building, "I've sat down in person and a year-and-a-half and it still looks like this." So we called and got a statement from the board of directors. They say they "cannot speak about it because it's a legal issue." Porchiazzo, who pays nearly $300 a month in HOA fees, says his attorney sent them a letter after he fell down the stairs. Plus, there's heightened anxiety after a fire this past weekend destroyed parts of another building in the complex, leaving Porchiazzo wondering if his story will repeat itself. Because of our reporting, Hillsborough County Code Enforcement will talk to neighbors and investigate their concerns. An inspector from Development Services is also coming out to look over the construction site for any problems. We're also told the association does have a current work permit that doesn't expire until September 7. But as repairs continue that date can be pushed back. We do want to mention that an employee of WFTS is a member of the condo's board of directors. But that employee is not involved in our news department and is not a part of our editorial team.